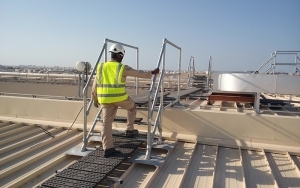 Kee Walk® is offered in standard modules, which can be supplied ex-stock for rapid installation on vitually any rooftop project. The modules are supplied as 1.5m and 3m pre-assembled sections to suit the requirements of different roofs. These lightweight modules are constructed from glass reinforced nylon treads attached to aluminium support beams that are fixed to the roof surface.